One of the most important elements of a wedding day theme is the bride’s choice of floral decorations. Everything from the bride’s bouquet, to those of the bride’s maids, to corsages for parents & grandparents, to the gentlemen’s boutonnieres are carefully chosen to compliment the color and design themes for the wedding day. Not the least of these choices is the decision regarding the reception room decor...the floral centerpieces that will adorn the tables where your wedding guests are seated. 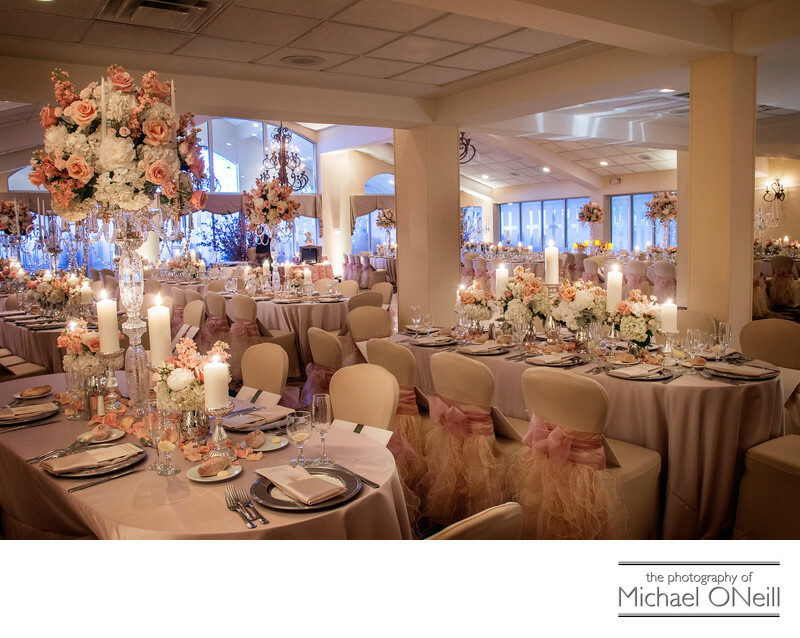 The ballroom you are viewing here is located at Lombardi’s on the Sound in the Belle Terre section of Port Jefferson on the north shore of Suffolk County, Long Island. I have been affiliated with all of the Lombardi’s Catering facilities for more than 20 years and have photographed hundreds of weddings at their establishments. This ballroom set up is arguably one of the most beautiful I have ever witnessed. The floral design work was the handiwork of James Cress Florists of Smithtown, NY, a firm that has been in business for decades longer than even I have. The mix of tall centerpieces in glass vases and floral clusters, both accented by tall votive candles gave an incredibly elegant atmosphere to the ballroom this day.